Good Morning. It’s Monday again. 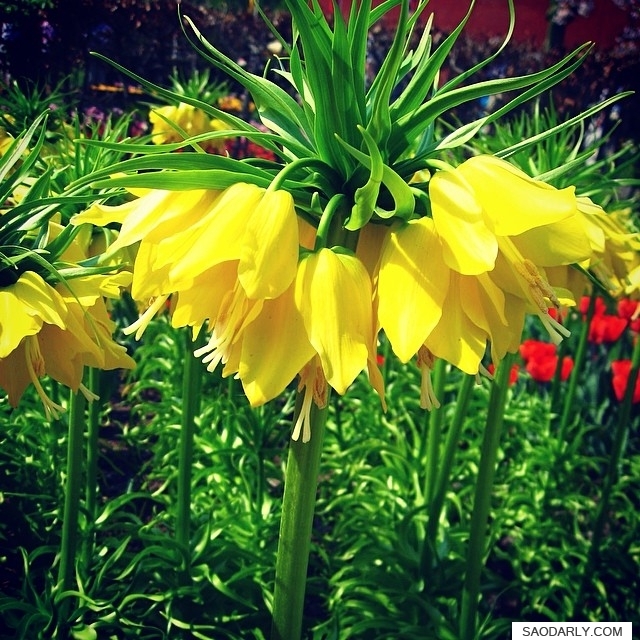 Here is yellow flowering Fritillaria imperialis (Crown imperial ‘Maxima Lutea’) to brighten your day. Fritillaria imperialis (Crown imperial or Kaiser’s crown) is a species of flowering plant of the genus Fritillaria, family Liliaceae, native to a wide stretch from Anatolia and Iraq across the plateau of Iran to Afghanistan, Pakistan and the Himalayan foothills. It is also widely cultivated as an ornamental and reportedly naturalized in Austria. The common names and also the epithet “imperialis” refer to the large circle of golden flowers, reminiscent of an emperor’s crown. This photo was taken at Keukenhof, the Spring Garden of Europe in Lisse, Holland (The Netherlands). I think the Crown imperial ‘Maxima Lutea’ is quite beautiful. It’s such a refreshing color for Yellow Monday. Have a good and productive week everyone!